This is the November Packet for 7th Grade - Volume 1! 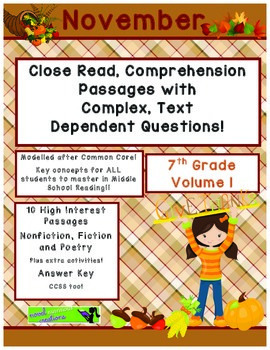 Close reading comprehension questions modeled after the Common Core standards for middle school. All of the following excerpts, charts, passages and diagrams are associated with either a variety of multiple choice reading comprehension questions, open-response questions, student inquiry, both short and long answer questions or a combination of strategies. Get your student used to taking complex-question assessments. Use for; weekly assessments, pre-assessment, post-assessment, progress monitoring, and whatever else you have in mind! Questions involve; close reading, using context clues, inference, poetry elements, plot, characterization, analytical reading, comprehension, reading for meaning, vocabulary and so much more! November Packet Includes 10 excerpts! 1- Nonfiction – Where Does Your Money Go? 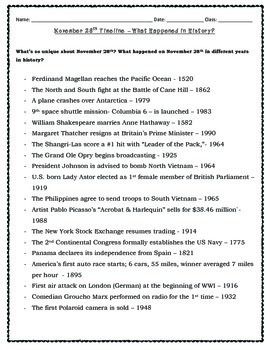 o	Fill in the blank with name, date or information using the timeline based on the context clues. -	Key Elements: Close reading, rhythm/meter, figurative language, mood, theme, imagery, word choice. * Be sure to check out all 7th grade Volume 1 monthly packets September - Summer! October 7th Grade Vol. 1 Packet here! December 7th Grade Vol. 1 Packet here! © 2015 Novel Nutritious Creations. Permission is granted to buyer for single classroom use. 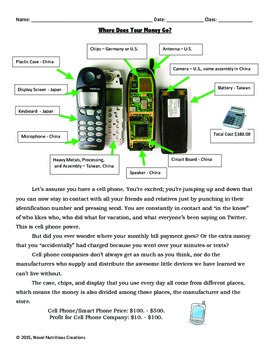 No part of this work, including clip art, may be copied and/or reused in another product or format.